For dry, itchy red eyes, the Solution is Clear. Active Ingredients: Hypromellose 0.20%; Naphazoline Hydrochloride 0.025%; Polysorbate 80 0.50%; Zinc Sulfate 0.25% Inactive Ingredients: Calcium Chloride; Citric Acid; Edetate Disodium; Magnesium Chloride; Potassium Chloride; Purified Water; Sodium Citrate; Sodium Chloride; Sorbic Acid Uses: For use as a protectant against further irritation or to relieve dryness of the eye. For the temporary relief of burning & irritation due to dryness of the eye. Relieves redness of the eye due to minor eye irritations. 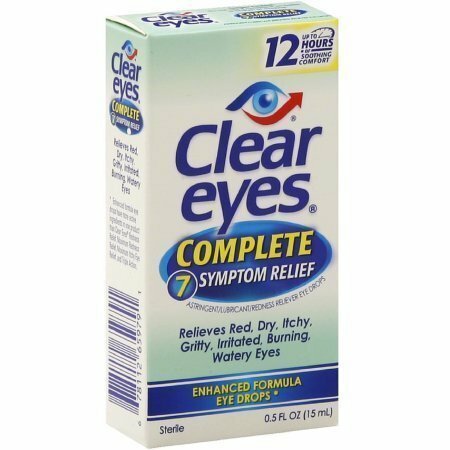 You'll find relief with Clear Eyes Complete 7 Symptoms Relief Eye Drops. It's formulated with an extra lubricant to moisturize and soothe dry eyes, plus a redness reliever and an astringent, to calm burning, irritated, itchy eyes.